Motherhood can deliver incomparable joy, but can also demand certain sacrifices to ensure that our children have the best possible care. At Advanced Aesthetic Surgery, we want to help mothers feel cared for during this special time as well. Pregnancy and breastfeeding often take a physical toll on your body, and sometimes causes changes that can be difficult to reverse. Even with an attentive diet and vigorous exercise, it can be challenging to restore your pre-pregnancy figure. With a mommy makeover, Dr. Tom Lintner can offer women the opportunity to address a number of common cosmetic concerns simultaneously. Mommy makeover procedures can rejuvenate the appearance of the breasts, abdomen, face, and other areas for results that look both beautiful and natural.There is nothing that can really compare to the joy that motherhood can bring. For many of us, this time of life involves a number of sacrifices in order to ensure we are bringing up our children in a world of love, happiness, and devotion. But the way we look does not have to be one of those sacrifices. Many women who have recently had children, as well as those who have already been raising children for a number of years, have trouble reversing the physical changes that pregnancy and raising a child can bring. A mommy makeover can help. With an array of effective cosmetic enhancement treatments, a mommy makeover can address a number of body areas, including the breasts, abdomen, and face, and renew your appearance with results that look both natural and beautiful. As a husband and the father of four children, Dr. Lintner values and appreciates all of the hard work that goes into motherhood. Each mommy makeover procedure is custom-designed to address your individual needs and cosmetic concerns, helping you to achieve your goals and experience a renewed sense of confidence. At Advanced Aesthetic Surgery, we offer what we like to call Concierge Medicine, and strive to treat you like a member of the family rather than simply a “patient.” Dr. Lintner has made it a top priority to give you personalized attention, communicate honestly and openly, and treat you with compassionate care. What Are My Mommy Makeover Treatment Options? Abdominoplasty (tummy tuck): Abdominoplasty is designed to correct weakened abdominal muscles caused by pregnancy, restoring a flatter midsection. Liposuction: Areas that tend to hold onto excess fat, like the abdomen and hips, can be contoured with liposuction, which removes this stubborn tissue for a slimmer shape. Breast lift: With breast lift surgery, excess breast tissue is removed and/or tightened to address sagging and create a more youthful breast shape. Breast augmentation: Silicone or saline breast implants can help restore breast volume and shape for a fuller breast appearance. Breast lift with implants: For those wanting to lift their breasts while also increasing their bust size, a breast lift with augmentation can often be very beneficial. Cosmetic injectables or dermal fillers: With options like BOTOX® Cosmetic and dermal fillers, fine lines and wrinkles can be diminished for a younger, refreshed look. Professional skin care: Correct skin concerns like acne, dark spots, and signs of aging with medical-grade skin care products as part of your custom treatment plan. 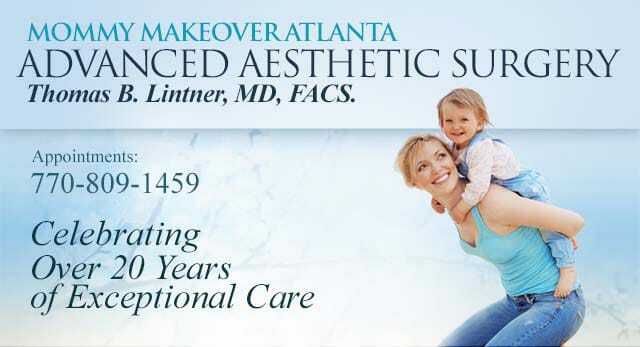 During the consultation process, you and Dr. Lintner will decide upon a mommy makeover treatment plan that can achieve your personal goals and have you looking and feeling better than ever. What Does the Mommy Makeover Procedure Involve? A mommy makeover can be performed all at once or in multiple stages, depending upon which treatments you select and your individual needs and goals. Before undergoing a mommy makeover, we recommend waiting a minimum of six months after childbirth for mothers who are not breastfeeding. For mothers who are breastfeeding, we recommend waiting six months after you are finished nursing before rejuvenating the breasts. Our team is committed to giving you comprehensive care and being attentive to your needs. With a mommy makeover, Dr. Lintner and our team at Advanced Aesthetic Surgery can help you restore your body after pregnancy. We have the experience and skills necessary to achieve effective and natural-looking results that yield a more youthful and vibrant appearance. How Long Is the Mommy Makeover Recovery? Recovering from a mommy makeover will be different for every patient since the combination of procedures will depend upon what each individual needs. Most women feel comfortable enough to resume much of their routine, including returning to work, at about two weeks after surgery. For those who have undergone breast surgery, patients should typically wear a post-op bra that opens in the front. Compression clothing may be advised for patients undergoing a body contouring procedure such as a tummy tuck or liposuction. More personalized care instructions will be provided and explained to you before your procedure to ensure you know what to expect and can prepare. Will My Mommy Makeover Scars Be Noticeable? As with any surgery, scars cannot be avoided. However, Dr. Lintner places incisions in areas that are easy to conceal, making them less noticeable after surgery. As you continue to heal over time, your incision lines should continue to heal, becoming lighter and flatter. The cost of a mommy makeover will be unique to each patient based on the specifics of their custom treatment plan. A number of factors will affects the total cost of your surgery, including which procedures are chosen, the expertise of the plastic surgeon, the geographic area of the practice, and anesthesia fees. During the consultation process, our team will provide you with a personalized quote to help you budget for your mommy makeover. If you are interested in breaking your total cost into smaller monthly payments, our patient care coordinator can help you get started with one of the available financing options. For more information about the mommy makeover procedure, or to schedule a consultation, please contact our office today.